The next set of enhancements to SubscriptionBoss satisfies quite a mixed bag of requests that have come up this year since the Winter Release of Infusionsoft. I therefore decided to break it down into 3 releases. This set of enhancements is being released first as it does not require much additional documentation. This technique can be used instead of, or in addition to, affiliate cookies. What you want to do it pass the affiliate code in a hidden form field to Subscription Boss. Rather than do this programatically or manually in HTML you can give the subb-button short code a parameter. Note: a space has been added after the square bracket above to avoid the short code being translated. Note: Remember to remove the extra space after the square bracket when you place your subb-button on your site. 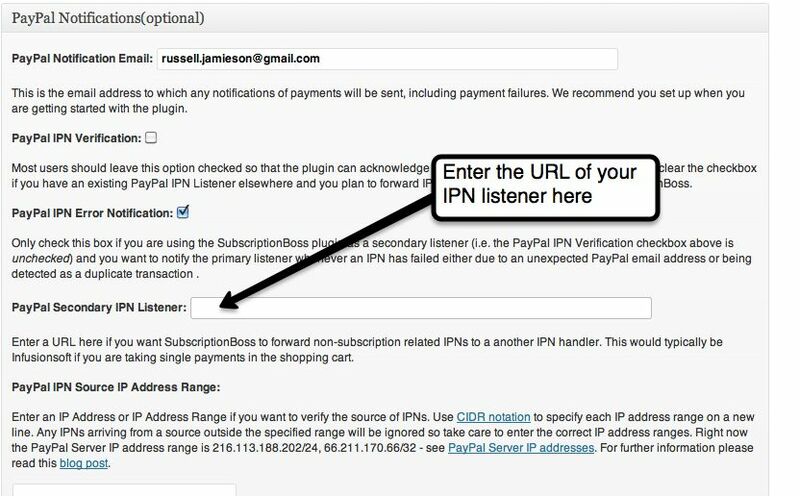 PayPal has a necessary restriction that one URL can be specified as the default IPN listener. However some clients want to have some IPNs relating to subscriptions to be sent to SubscriptionBoss and others for single payments to be sent to Infusionsoft. To resolve this the SB IPN processor now has a forwarding facility: so if an IPN refers to a subscription then it will process it, however if the IPN is not related to a subscription then it can forward the IPN to another URL for processing. This URL could be either Infusionsoft or a custom script. SubscriptionBoss used to report an error for the second of the two IPNs that it receives for e-checks. The first IPN is typically received with a status of “Pending”; and the then the second IPN arrives 3-5 days later with a status of “Completed” or “Failed”. SB used to report a “Duplicate Transaction” error for this. SubscriptionBoss used to report an “Invalid Receiver Email Address” for MassPay IPNs. Since MassPay IPNs refers to outgoing rather than incoming payments this logic was incorrect. SB no longer reports errors for MassPay IPNs.